Well we do have uncanon things on the server. But I understand. I guess it is to much work for so little anyway. No offense to the person who created those, but I want to politely state I don't want those flags in the module either. The majority of them don't exactly look as if they were created by a professional artist. Nor by an adult, to be blunt. We have a lot of talented artists. I think it would be cool if they re-did the flags and coat-of-arms featured in the the links you provided, Blue. The actual styles aren't bad from the links, if someone from the community were to remake them. They look like they were done in the Middle Ages, when people were not professional artists and few people had classical training in the arts. I think they look like they were done in Microsoft Paint. The Middle Ages had some pretty damn impressive art and nifty family crests. Although I agree that the quality of the artwork is going to be directly related to how advanced the culture in that country or domain is. Either way, with the exception of a few images those flags would look out of place when compared to the original aesthetics of the game, in my opinion. I can appreciate the interest and effort whoever created them put into the flags, but I agree they would seem out of place. Vallaki and more so the Village are dark and dreary, in a state of decay. Maybe in Dement or in Sithicus colorful banners or flags would be more in line with the themes. The colors of the original flags of this thread are not the problem. It's that they're too modern in feel and design, and that the symbolism doesn't match. Firstly, as I said earlier in the thread, the idea of a "national flag" is far too modern. And then there's the symbolism used. Barovia's "flag" has a crown. Why? Neither Strahd nor his father were kings and neither of them wore a crown. Dementlieu's "flag" has a cannon. Again, why? Dementlieu may use gunpowder in its military, but it doesn't have much of a military to speak of. It is a peaceful nation that exports fashion and art and literature. Why on earth would their flag have a weapon on it? The other symbols are too abstract for a medieval society. Medieval banners were often "busier" than modern flags and often had animals as symbols, either real or mythical (lions, bears, eagles, griffons, unicorns, etc.) and the family name and/or motto, and so on. That said, those sigils would also be too brightly saturated if you were to implement them in-game. But they do strike the right balance between stylised graphics and maintaining a certain level of detail. Of course you have to keep in mind that those are designed for Dementlieu, a domain with advanced arts. Any crests found in Barovia would probably have far less vibrant colours and less use of colour in general. Flags banners are the same things. That they are not canon, does not mean they can't be added I mean we got raduta keep now instead of zeklos. So yea saying canon has no longer become an excuse. If you refuse to except banners cause they where none existand I suggest you read your history books again that cover the world outside America. There was once this nation called Roman empire, I wonder how they handled the colons on the battlefield...oh right with banners. If the flags got reworked a bit to fit the nation more I say it is a nice addition to already a great thing. But then again not a dev made it and I think that's the true problem here now ain't it. Dutchy, your tone is not acceptable. Consider this an official warning. Yes, they had flags and such since ancient times, but they were not NATIONAL flags. There was no one single "Flag of the Roman Empire." Flags representing an entire nation did not come into being until the 18th century (1700s). But I've already explained this in the thread, as well as why the flags posted are not acceptable. Please read the entire thread before commenting. Another thing I've already explained to you: adding a "non-canon domain" is not contradicting canon. The makers of the Ravenloft setting encouraged DMs to created their own darklords and domains to add if they felt like it. These flags would contradict canon, because there are stated designs in the published books and there are stated historical periods for each domain to imitate, all of which are before the 1700s. And even after stating all that, sometimes we actually do contradict canon, but not without a good, compelling reason. These flags are not a compelling reason. I dislike vegans you don't see me giving them a warning. Immature of you to wave your (power) around like that cause somebody disagrees, THAT behaviour is why nobody calls you out on this forum, cause those that do end up banned. You do this often to. Lead by example is what often is said. So where is your warning? Just cause you are head dm you are not immune. So yes I got a problem with that, there is nowhere I can go to complain about your behavior cause you get covered from all sides. Il reply on the rest of your post later and more proper. I mean, there is "historical" games like Crusader Kings where they give every important family a flag of their own. It adds a bit to it. And it gives identity beyond "Random Noble knight nr:31232"
I can see the problem about it true but I do believe it would be canon to have family symbols, atleast in Port a Luciné. Even rugged middle ages families in Sweden had it. But I can also see the problem with implementing it! Barovia I guess might be really big time backwater. As I said alter the flags to fit the purpose. Countries are no longer canon already so what dmg would a flag do beside making characters unefied behind a symbol? I do not act the same as you dutchy. I can be blunt at times, but I try my best to stay civil. You are regularly combative, denigrating, contrarian and sometimes even insulting to people, usually those on staff. The staff doesn't need to put up with it, and as owner of these forums it's my right to let people know when they're out of line. And if you want to argue about moderation, do it in PMs, not on the public forums. In terms of historical accuracy I have read that our modern idea of a 'nation' stems from the French revolution. Also, medieval illustrators likely had very different philosophies about how to properly illustrate than is the norm nowadays. So if this happend on the street. I should have walked home and called you up to not make a scene when I got called out.??? You called me out and I responded in this topic as you are doing now in the same manner, you did bot send me a pm no you publicly called me out so I respond the same way. Do not know what you are used to where you are from, but here we settle things out in the open without a problem or bitter feelings afterwards. so no I do not accept your warning, you fail often at being civil as I do as being subtle. I like something like this for a general Barovian flag idea. Plus, going with Black and Red would provide a historical precedent why the Red Vardo chose those colors. Sure, that would be nice, and family crests would be more appropriate than national flags. Right, well the whole "national flag" arose from ships "flying their colors" in the early 1700s. Having a simple flag recognizable from a distance was an important way to let other ships know you aren't a bunch of pirates (but it also ended up being a easy way for pirates to trick others). This eventually spread to use on land as well once those ship flags became the accepted symbols of their nations. Still a relatively modern concept, and unlikely to arise that way in Ravenloft since its seas are almost un-navigable. Totally agree on the symbolism. Would be more fitting for more Slavic designs than Saxon inspired for Barovian hereditary and battle banners. I can imagine they'd exist since it's one of the few Domains with an actual military history of campaigns fought against other nations. Enough. You're distracting from the discussion. What most wish is a code of arms and such as pirates had for their vessels. They don't mean nation wise, yes be nice if it was nation wise, but just banners in general could be a nice addition. Lamordia's really the only country in the Core with an actual honest-to-goodness navy, if memory serves. Even so, I think countries like Dementlieu (where there would be a fair amount of nationalism and pride in the culture they export), Falkovnia (where the state is supreme), Zherisia/Paridon, and Nosos (both being incredibly advanced) would have flags, though I think Dementlieu would still be steeped in factionalism due to all the different noble families vying for power. I do like the idea of family crests being prominent in Dementlieu, incidentally, which is part of the reason why I made those crests for each major noble family in Dementlieu, back when I was a DM (some families featured being canon, others being home-brew, to be used in events that I ran). Edit: Apparently, Azalin has doubled the size of his own navy to deal with piracy near Martira Bay! Well, with all the talk of pirates and ships, bumping this with some more information on piracy in the Core. I was curious to know where pirates lived since that was brought up in the Blaustein topic, so I looked at the coastal domains to see if there were any mentions. Turns out there are quite a few pirate havens on the coasts of the Core and they tend to prey on towns and harbors. In the Sea of Sorrows, Martira Bay is a pirate haven (Gaz II, Darkon section) because it is dotted with many small islands that are the lairs of pirates and smugglers. Recently, Azalin doubled the size of his navy and his biggest ship (whose name I forgot) is stationed right at Martira Bay. 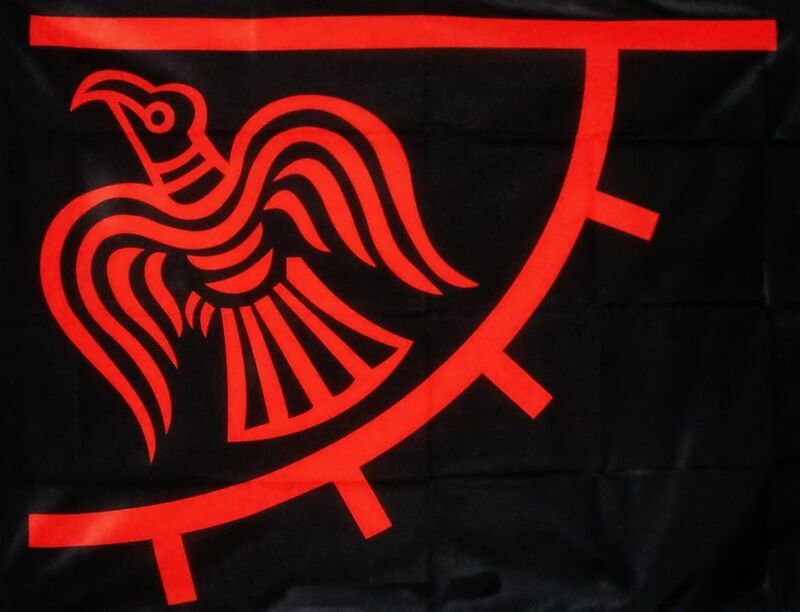 Qoute from "Adam's Wrath" on Lamordia's banner thing "In Summer, bright red and yellow banners bearing the Von Aubrecker crest (A black Eagle) fly from the battlements..."
Giving that the country while ruled under a Barony, has republic settlements.. I can see the ships flying the Aubrecker crests if they need to be identified.